Title Text: Planets are turning out to be so common that to show all the planets in our galaxy, this chart would have to be nested in itself--with each planet replaced by a copy of the chart--at least three levels deep. I was so hoping when I clicked on the scaled-down image that it would expand to 1:1 scale and blow my browser (and my mind) out of this solar system. Last edited by rhomboidal on Wed Jun 20, 2012 7:37 am UTC, edited 3 times in total. There is no hidden joke. Don't even worry about it. I can't imagine that we'll know anything about the make-up of these planets in our age. It's going to take more than telescopes and reflected light. What tools would give us anything but the mass compared to the star it's around? MotorToad wrote: "That's no moon...."
Well, for starters, if we are fortunate enough that the planet eclipses its star, we can get the spectra of the exoplanet's atmosphere. I am sure there are more things that can be done, but this is what a few of my classmates were working on last year (and they loved to talk about it in class ). I was going to say something along the lines of "Does this mean I'm colorblind?" The solar system is missing a dot. '; DROP DATABASE;-- wrote: The problem with imagination is it does a lousy job of interacting with the physical world. And you look crazy when you talk to it. Something obvious that I didn't realize at first: If "huge" is anything an order of magnitude beyond Earth, then the only non-huge exoplanets in the picture are the few tiny dots. I'm guessing the blue ones are ice giants, the ochre ones gas giants, and the deep red... I don't know, hot Jupiters? Whyareall wrote: The solar system is missing a dot. There are four dots, which is all. The smallest is only visible in the full-size version, and is near the bottom. Last edited by Arancaytar on Wed Jun 20, 2012 4:49 am UTC, edited 1 time in total. I wonder, is there any significance to the size/scale of the circle used? Last edited by Kename Fin on Wed Jun 20, 2012 6:15 am UTC, edited 1 time in total. This new comic 1071, being named “exoplanets.png” has broken comic 786, which was also named “exoplanets.png”. If you add up the cross sections of all the planets, divide by the scale factor, and subtract this from the circle's size, you get the area of the circle that contains text or free space. Other than that, I doubt there is any significance. As it is already dependent on the text and the packing of the planets, using it to represent any sort of data value would constrain the entire layout in a complex fashion (not that that's stopped Randall before). Qaanol wrote: This new comic 1071, being named “exoplanets.png” has broken comic 786, which was also named “exoplanets.png”. Picture postcards of the old comic suddenly became extremely valuable. Does anyone else find it odd that the comic displaying all 786 planets broke comic 786, "Exoplanets"? Imagine if we could build a telescope that could "see" beyond the speed of light, allowing us to see distant objects in their current time. You could use a temporal zoom control to travel to the system's current time and see its thousands of years of evolution in just a few seconds. That is, until you see a blinding flash of light, then nothing at all. You then realize the system's sun had already gone nova, and there's nothing left! If small planets are fairly common, does that mean we can reinstate Pluto as a planet again? The worlds need more infographics. Does the color have any significance (such as what we believe it's made out of, etc.) or just for effect? pbnjstowell wrote: If small planets are fairly common, does that mean we can reinstate Pluto as a planet again? No, sub-planets are expected to be even more common. The most important bit is the part that given it is difficult to discover small planets, we can estimate how many we cannot detect, and these estimates say that there are more small planets than large planets, small being up to a couple of earth-masses, but large enough to clear its orbit. We detect most planets by their diminishing of stellar light by passing in front of their stars. More info here, on the Kepler Mission page. And: COLORS, for crying out loud. As interesting as the graph is, it reminds me of bad parts of the seventies. Perhaps this was an inevitable Pluto reference. "Telescopes and reflected light" were all that we had of the planets in our own solar system until the 1960s when we could send probes to go look at them up close. Thus, I am confident that sufficiently powerful telescopes could give us data at least comparable to our circa 1960 knowledge of Mars, Jupiter, and Saturn. Even with better telescopes, we'd still only see the planets as they were many years ago. "This is our solar system"
"We know nothing about what's on any of them." We've got a long way to go if we know practically nothing about the very planet that we live on. So what i wonder is if there might be life on other planets but cause they are so far away it has yet to manifest itself in anyway. I thought the missing dot was a reference to Ceres. ldsheinz wrote: So what i wonder is if there might be life on other planets but cause they are so far away it has yet to manifest itself in anyway. Or maybe we can detect traces of some industrial civilizations in the near future but that planet will be some hundred light years away and today they would have already destroyed themselves with nuclear holocaust, which we would never know. It's okay, according to the alt text, we're still safely halfway away from the Matryoshka limit. I always confuse exoplanet to mean a planet that could host extraterrestrial life. But is there a hidden message that only the colourblind can see (easily)!?! The first time I loaded this comic, I saw comic 786. Every time after though, I saw comic 1071. Why are some of you being confused about the 'dots' in our solar system? The two huge ones are Jupiter and Saturn, the blue balls are Uranus and Neptune, the two dots in the middle are Venus and Earth (I guess), the tiny dot above Jupiter is Mars, and the tiniest thing at the bottom is Mercury. All eight are accounted for. There's no Ceres or Pluto joke in the picture. Does anyone else find then title "Exoplanets" annoying when planets in our solar system are also shown? Antior wrote: Why are some of you being confused about the 'dots' in our solar system? But the old definition of planets is still in the public consciousness, so it gets dredged up virtually everytime the planets are listed in a publicly trafficked forum. To be clear however; Ceres, Pluto, Makemake, Haumea, and Eris are all missing from the box o' dots Randall made to represent the Sol system of planets. He only included the known Terrestrial Planets and Gas Giants, while leaving out the Dwarf Planets orbiting the Sun. It should be noted that from a planet-hunter's perspective, a large moon is potentially bigger and more likely to be found than a small "legit" planet, as defined. Case in point, two moons in this solar system are larger than the smallest planet, Mercury (Ganymede and Titan), and by that fact alone are more visible to distant observers. Also, that those two in particular are much further from their star, compared to Mercury, makes them that much larger a target, visibly. Think of that as the most basic optical illusion (see Perceived visual angle), and is a critical consideration in calculating the likely actual sizes of these exoplanets. That raises a relevant point ... he's consolidated a lot of separate observations, from a number of sources, into a single graph here. Yet each represented exoplanet is only an approximation of the actual size, each with its own margin of error. Oh well, I suppose that makes it a fascinating collection of best guesses. Last edited by JimsMaher on Wed Jun 20, 2012 9:39 am UTC, edited 1 time in total. between3and30 wrote: "All 786 known planets"
Technically speaking, we only feel like we know much about earth, but for each known fact there are a few dozen unknown ones, but they don't come up in everyday live. So earth is actually and truly undiscovered yet. Observationall sciences amuse me with they'reterrible language skills. 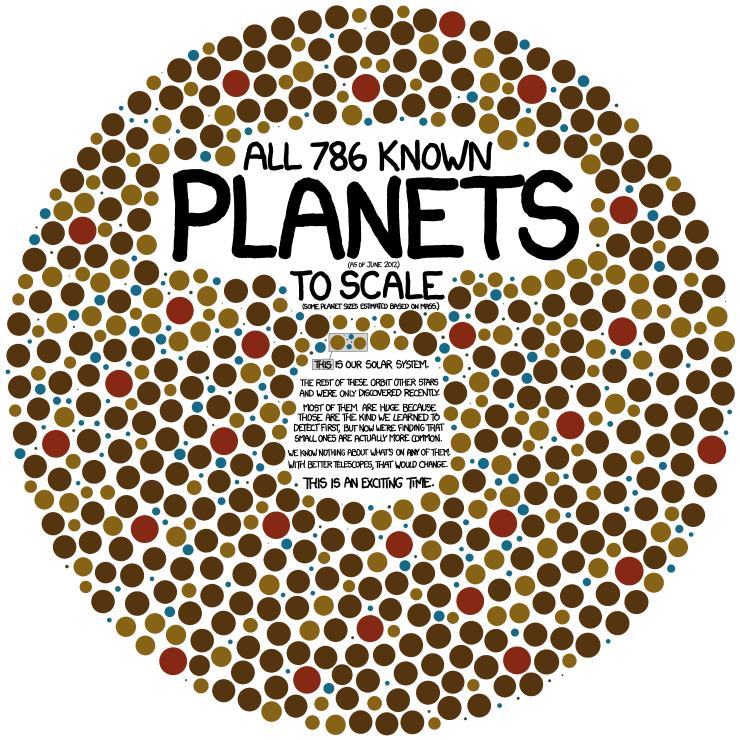 These are the 768 known planets. Planets are turning out to be so common that to show all the planets in our galaxy, this chart would have to be nested in itself--with each planet replaced by a copy of the chart--at least three levels deep. So... obviously we know about more?? DOH! This's how crap like the "only using 30% of your brain" rumor gets a started. Does anyone else think this comic works best if read in the voice of a giddy child?